Rancho Cucamonga—August 4, 2013—Crowdfunding has emerged as the fastest growing method of raising money for businesses and other projects. In America it is a $6 Billion dollar business. Most people dream of having a Kickstarter campaign that raises millions of dollars but have no idea as to what makes a winning campaign. Over 65% of the people using any crowdfunding platform fail to reach their goals. Dr. Letitia Wright, Crowdfunding expert has created an audio CD that shares the secrets of success in just 5 steps. “Many of the people who ask me for help are only a week or two from launching their campaign.” Says Dr. Wright. “So I created something that would quickly educate them on what needs to be in place in order for them to get fully funded. It’s foolish to think you can be successful with absolutely no training on a new method you just heard about last week.” The audio CD also has a bonus session for those who are already in the crowdfunding campaign and are not seeing the results they wanted. “If you are already 30 days in, you can tell what direction your campaign is going. There are 5 specific area you can check to make sure you are track to reach your goal. One of them is your updates. People fail to update their project and keep the momentum going. And certain kinds of updates will resonate with your tribe better than others. Creating something that keeps everyone excited about your project is important.” Says Dr. Letitia Wright. 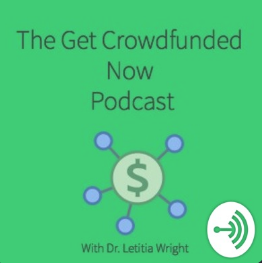 Dr. Wright’s Audio CD- Introduction to Crowd Funding: 5 Steps to $20k is available on her website at http://acflife.com/crowdfunding-cd Dr. Letitia Wright is America’s Crowd Funding Strategist and a Leading Crowd Funding Expert.